Supplied with many of the companies new weaving looms, this book is a guide to using Leclerc's Rigid Heddle and small Tapestry looms. Written in both English and French it covers warping and operation with specific sections on the Bergere, Maya and Penelope looms. General information on rigid heddle weaving as well as sections on beginning and advanced tapestry weaving are provided as well as a number of projects geared towards these two types of looms. This book includes a Glossary, Bibliography and is illustrated using line drawings and black & white photographs. This reprint of Haddon and Start's classic 1936 monograph on the fabrics of the Iban of Sarawak makes available again a rare and detailed study of Iban textile techniques and ornamentation. In 1936 Alfred Cort Haddon, one of the founders of modern anthropology, and Laura E. Start published their descriptive catalogue of Iban or Sea Dyak Fabrics, which Haddon brought back to Cambridge. This work, a byproduct of the famous Torres Straits Expidition in 1899, was published some thirty-seven years after Haddon's visit to Sarawak. It's main emphasis was on the way Iban cloth was produced and how the patterns were made. It contained much interesting detail in the jackets, petticoats, loin-cloths, girldes, shawls and blankets that the Iban used, sometimes for everyday wear, but mainly for their ceremonies. A touch of the old master can be seen in Haddon's tantalisingly brief analysis of Iban patterns, their anthropomorphs, zoomorphs any phyllomorphs, as well as more mundane objects and natural phenomena, in his general considerations, and in his comments about Iban religion and its expression in decorative art. The work was also notable for the particularly fine and detailed line drawings, which to this day remain the most comprehensive set of illustrations of this fascinating art form. Since Haddon and Start's pioneering work, anthropologists have gained a much greater knowledge of Iban territory, and Sarawak and Borneo generally. At the same time there has been a striking growth of interest in the textiles of south-east Asia. In particular, this has been stimulated by the revival of the old skills in making ikat cloth after its virtual disappearance. As an original source, a technical account of Iban cloth making, and as a record of traditional designs, Haddon's volume remains an invaluable work of reference. This book is much more than a catalogue of the collection of Iban textile techniques in the Cambridge Museum of Archaeology and Anthropology. It is also a pioneer in the study of Iban decorative arts and symbolism. Ann Sutton's The Structure of Weaving is widely regarded as essential in any weaver's library, and it has been adopted as the first and second year textbooks in colleges throughout Britain, the USA, Canada, Australia, Japan and Scandinavia. Now, with Diane Sheehan, she goes beyond the knowledge and manipulation of structure to help weavers produce cloth that is exciting as well as technically correct. By examining some of the great textile ideas of the past and relating them to the stages of making a woven cloth, the authors aim to give confidence to all weavers, at whatever level of attainment, to have the ideas that will make the cloth of today as exciting and glorious as the fabrics of the past. With games, exercises and breathtaking photographs by David Cripps, the authors show how breaking rules, finding new ways of adapting equipment, re-discovering neglected properties of yarns and fibres can add that extra dimension that turns a good textile into something great. Yarns, Reeds, finishing techniques, special tensioning devices, colour, combining techniques, and discontinuous warps are some subjects touched upon. It's an idea book, rather than a very specific "how-to" one, and its ideas are supplemented with pictures. Ideas in Weaving, a logical sequel to The Structure of Weaving, will be indispensable for everyone who makes, uses and appreciates beautifully designed and executed cloth. 1996, Unicorn Books and Crafts, Inc.
Ikat, the original book published in 1980, was hailed as "the most complete and authoritative volume written on the subject." This revised edition is even bigger and better. Van Gelder's revised, updated and expanded book includes new chapters on ikat knitting and shifu (the art of Japanese paper spinning and weaving). The hallmarks of ikat - pattern, colour and detail - are gloriously illustrated in the "Gallery of Ikat" photo section. An introduction to the world of ikats by Professor Alfred Buhler, the well-known authority on the subject, sets the stage for this comprehensive volume. A succession of projects, each building on the previous one, provide in-depth instruction in this technique. The 12 projects included in this book are: "Flame Motif", "Twice-Dyed Ikat", "Sumba Warp Ikats", "Sumba Arrows", "Random Warp-Ikat Stripes", "Weft Ikat", "Simple Weft Ikat", "E-gasuri", "Traditional Overshot", "Contemporary Overshot", "Simple Double Ikat", "Geometric Double Ikat with Weft Ikat" and"Compound Ikat". A list of suppliers, places throughout the world to find ikat collections, and an extensive bibliography are included. In short, everything one needs to know about this age-old technique is here. Additional highlights in this book include: historical information, design considerations, equipment requirements, projects with step-by-step instructions and photographs of contemporary Ikats. The book is well illustrated using both black and white and brilliant colour photographs. They may look alike to the untrained eye, but there are scores of different breeds of sheep in the world. In Sheep's Clothing looks at a hundred of them, with special attention to the characteristics of the wool of each, from baby-soft Merino to silky Lincoln to sturdy, coarse Karakul. In this book the reader will find expert advice on selecting top-quality fleeces, cleaning wool efficiently and thoroughly, spinning and plying a variety of yarn styles as well as teasing, flicking, combing, cardign and other wool preparation methods. Actual fleece locks are shown in full-size photographs, and knitting, crochet, weaving and other techniques illustrate the importance of matching wool type to end use. This highly readable, authoritative reference work is essential reading for handspinners, wool growers and other fibre craft enthusiasts. Indigo is the compelling story of the world's oldest, most magical and best-loved dye. Produced from plants by a process akin to alchemy, indigo has a unique chemistry that renders it compatible with every type of natural fibre. What is more, it was in the past combined with other natural dyes to create an astonishing range of colours now only produced by synthetic substitutes. It is hard to imagine today the incredible impact that indigo must have had on the many civilizations that discovered its potential. The blue dye indigo has been the world's most valued dyestuff for almost 5,000 years. This is the first book to cover in detail all aspects of the subject - historical, agricultural and botanical; chemical and technological; commercial and economic; indigo's various uses in textiles and its many sociological, medicinal, folkloric and other connotations. The author examines, from first hand experience, the different plant sources and compares the production and dyeing methods practiced in different cultures. The various patterning techniques used with indigo on a wide range of textiles, both humble and exotic, are described. Finally, the modern and possible future applications of indigo are looked at, including the ever-popular blue denim. Superbly illustrated with textiles from around the globe and the authors own field photographs, Indigo is the compelling story of one of the world's oldest and most magical dyes. This fascinating book contains 150 colour and 50 black & white illustrations. The rich complex blues, greens, purples, reds, teals, golds, and browns of Renaissance tapestries and oriental rugs all cam from natural dyes, and so do the glorious hues in this book. Using traditional dyestuffs, minimal mordants, and a creative approach to dye mixing, overdyeing and pH modification, Trudy Van Stralen shows how to produce a stunning range of colors from just a few dyepots Dozens of full-page photographs present a feast of color on fibres, yarns, and fabrics, along with instructions and recipes for reproducing them. The book includes in-depth discussion of more than twenty of the most important natural dyestuffs, and more than 200 individual recipes. The book begins with a series of chapters explaining the process and titled: "Equipment & How to Use It", "Preparations for Dyeing", "Mordanting", "My Approach to Dyeing" and "Many Colors from a Few Pots: A Dye Workshop". This is followed by a 60 page section titled "A Portfolio of Color" which provides specific information about dyeing with a number of dyestuffs along with a wonderful collection of pictures showing the dyestuff as well as the finished yarn and fabric. Dyes and combinations covered in this section are: Kamala, Osage Orange, Marigolds, Goldenrod, Dyer's Coreopsis, Parmelia Lichen, Madder, Red Sandalwood, Brazilwood, Cochineal, Cochineal & Fustic, Cochineal & Marigold, Cutch, Black Walnut, Black Walnut & Red Sandalwood, Sumac, Alkanet, Logwood, Logwood & Yellows, Orchil Lichen, Indigo, Indigo & Cochineal, Indigo & Black Walnut and Indigo & various Yellows. The author's analytical but common-sense approach is equally appropriate for the beginner and the dye professional, and her environmentally aware use of mordants makes natural dyeing safe once again both for the dyer and for our earth. This handsome, hard-bound edition of a classic book is a complete manual for narrow band weavers or what is know known as inkle weaving. The author clearly explains concepts and techniques such as plain weave, color arrangement, various pick-up patterns, double-weaves, and other byways from around the world and includes many charted patterns in a new notation. This how-to section is great, but filling it out is a long section on many regional narrow band devices and methods leading to our contemporary inkle looms. This is a basic textbook, reference book, and a new "old friend" for narrow band weavers. The author explains that her goal in this book is to show possibilities and variety in technique without confusing the weaver with a variety of amusing or complicated designs. Her step-by-step procedure starts the reader with the basic principles and then after they have mastered them, takes them from easy to complex in simple steps. She does this by breaking the world of inkle weaving down into "systems" and a chapter called "Introduction to Systems" introduces the author's system of classifying inkle weaves as well as covering the theory behind Drafting, Threading, Weaving and Colour Theory. It also includes a section with a collection of short cuts, hints and suggestions which she groups as "Tricks of the Trade". This introduction is followed by eight systems discussed in their own chapters are "Plain Weave", "Alternating", "Speckled", "Reticulated", "Floated Weft", "Floated Warp", "Double Weave" and "Tapestry". Each system is explained in detail and then with a number of examples showing the finished band as well as the weaving instructions. Other chapters in the book include "This, That & Other Things" and "Fantasies", which add to the weaver's knowledge of this subject. Chapters entitled "Antique Looms" and "Modern Looms" describe and provide pictures for about 30 different band looms, some of which have rigid heddles, rolling beams and harnesses that are foot powered as well as a wonderful collection of historical drawings on the subject of inkle weaving. The book includes more than 100 black & white photographs plus line drawings and many, many patterns and threading charts. The author has also written the book Four-Harness Huck. Everything you need to know about inkle weaving is covered in this book, including directions for four different pick-up techniques. Helene knows and respects her subjects well and has the facility to write clearly, thoroughly, and yet with a lightness that puts you at ease and makes learning effortless. Of course, the basics are covered, and many interesting and practical variations are described. The pick-up weaves are described in words and are accompanied by clear pictures. Good finishing techniques, ways of joining bands to make wider pieces such as pillows, purses and ponchos are illustrated and many ways of using bands are shown. The author makes extensive use of black & white photographs and pictures and 8 pages of full colour pictures are also provided. Other books by the author include: The Weaving Book: Patterns and Ideas. If you've always wanted to learn to weave, but didn't know where to begin, this is the video for you. This course is designed to acquaint you with the basics and help you choose a direction in which to begin. It starts with an overview of what handweaving is, what can be woven, plus a look at several types of looms and how they work. You will become acquainted with a number of small tools used by weavers, as well as the vocabulary of weaving terms needed to understand the process. You'll learn about warp and weft yarns, and how their size, weight, elasticity and fibre content relates to specific projects and fabrics. The detailed exercise in figuring out how much warp and weft is needed for a project will become a valuable resource as you continue with future weaving projects. You will also learn how to prepare (measure) the warp using a warping board. This course is recommended as a prerequisite to other video weaving courses for those who are new to weaving. An exciting new hobby awaits you! The only prerequisite is a curiosity about weaving, and a desire to learn. The course is an overview lecture/demonstration so no materials are needed. Other works by this author include the book Learning to Weave and the video Beginning Four Harness Weaving. Jason Collingwood has written a clear, easy-to-follow monograph of directions for weaving the rug featured on the cover. Starting with the rug structure and moving along through warping, tensioning, tie up, weaving, and finishing, you will have a beautiful weaverly rug, if you follow the directions exactly! Jason has described every step in the process very clearly. There are 15 diagrams to make the directions even clearer. 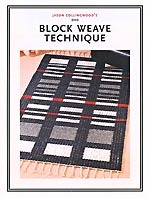 Primarily written for the featured rug, the techniques can be applied to any weft-faced wool rug. The author has also produced the video Rug Weaving: Block Weaves and Shaft Switching and we also stock Jason Collingwood Rug Yarn. Peter Collingwood, who died in 2008, was the most important British weaver of the last 50 years. This special edition of The Journal for Weavers, Spinners and Dyers gives a comprehensive insight into Peter Collingwood's technical knowledge and innovation which is mostly expressed in his own words. This wonderful collection of articles by this master weaver includes: "Two Weft Distortion Effects in Plain Weave", "Angelfells", A Two-Faced Cloth", "Weavers I have known, by Peter D Bunker", "A 3D Hanging", "Competition and Report", "A Rug in Tie and Dye Technique", "Macrogauze Hangings", "A Weaving Project", "Royal Mail Stamp", "An Unusual Method of Handspinning", "A Development of Shaft Switching", "Rug Finishes", "A Selvage Idea (for Twill)", "Neolithic Weaving Techniques", "A Note on Rug Designing", "A Strip-Tapestry", "A Belt from Nebaj, Guatemala", "Two-Shaft Pick-Up Weave for Rugs", "A Shaped-Tie Woven with Tablets", "Weaving with Music", "Reply to the Editor", "Words and Music", "Reviews" and "Book Reviews". Also included is "Reflections on my Father" by Jason Collingwood, "NERDS or Nayland Express Research Devoted to Saziygo" by Ralph Isaacs, "A Miracle of Invention - Peter Collingwood Discusses Ply-Split Braiding" by Jennie Parry, "How and When I Learned to Weave" by Margaret Seagroatt as well as a short article "Royal Mail Stamp" and a Chronology of the weavers work. This collection is a wonderful tribute to Peter Collingwood and his life's work. Other works by this author include: Peter Collingwood - His Weaves and Weaving, Rug Weaving Techniques: Beyond the Basics, Techniques of Ply-Split Braiding, The Techniques of Rug Weaving, Techniques of Sprang and The Techniques of Tablet Weaving. This is one of a series of Monographs produced by the Weavers Guild of Boston, Massachusetts. The miniature drafts found in this volume are the work of Miss Josephine E. Estes who began miniaturizing large Overshot drafts in the early 1930s. Her goal was to create designs suitable for smaller, less expensive articles for the Depression-era market that still had the appearance of older patterns. Most of the designs are reductions of the old colonial patterns while some are developments suggested by old patterns. The illustrations include more than just one pattern (repeat) unless the pattern is a large one. This is done so as to show how the secondary figure looks when it is completed by the repetition of the pattern. The 48 patterns described in this book are grouped by the number of threads required (under 20, 20-29, 30-39, 40-49, 50-59 and 60-90 threads) and include designs like "Foursome", "Rings and Crosses", "Weathervane", "Lover's Knot #2", "Cross of Tennessee", "Pond Lily", "Whig Rose" and "Martha Washington". A similar subject is covered in Weaving Designs by Bertha Gray Hayes - Miniature Overshot Patterns. Other monographs by the Weavers Guild of Boston include: From Weaving to Knitting, More Linen Heirlooms and Versatile Bronson. The woven beauties described in this book are household textiles from Latvia. They are pictured and analyzed in this valuable English-language reference for handweavers, textile historians and anyone interested in Latvian folk art. Early Latvian weaving texts and fabrics in museum and private collections are sources for the hundreds of nineteenth- and twentieth-century examples shown. Drafts are given for 4- to multi-harness weaves, ranging from fine linens to coverlets and reversible rugs. 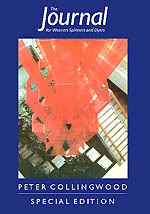 Special features include: a detailed survey of weave structures providing a valuable technical resource, Contemporary projects, adapting traditional weaves to creative new uses, Freeform method of patterning on four shafts for creative designing, Double-harness weaving system for multi-harness weaves and Drafts with tie-down warps for versatile and functional weaves. As well as providing a wonderful collection of 300 drafts, this book provides a valuable insight into the culture and legacy of the weavers of Latvia. Sections discussing Fibres, Dyes, the Weaving Equipment used and the drafts are brought to life with the author's extensive use of images which include 41 illustrations as well as 50 colour and 104 black and white photographs. This book is truly a joy forever! This is the first paperback edition of a manual well known to weavers for its great thoroughness, clarity and value to beginning and professional weavers alike. The author, Osma Gallinger Tod, has drawn upon many years' experience as a teacher and writer in preparing this practical text of basic weaving techniques and projects from the simplest to the extremely complex. Each topic of weaving theory and technique is presented with its practical applications in mind. Within the first thirty pages, readers learn enough to complete their first weaving project, a bookmark, and this leads directly to the weaving of rugs on a frame. In the following chapters the author discusses American Indian weaving, the shed and its variations, weaving a table mat or rug on a loom, the process of weaving on a two-harness loom, threading plain weave from a draft, making a two harness table loom (readers following the clear diagram and instructions will have no trouble building the loom), preparing the weft, handling of threads, two-harness design methods, the weaving of rag rugs in plain weave, useful articles woven with striped warps and wefts, tapestry technique, and design weaves. For advanced weavers, the second major section of the book covers a great variety of weaves for the four-harness loom and related information: how to warp and thread a four-harness loom, weaving both plain and pattern weave, the twill family of weaves and herringbone variations, the principles of overshot pattern weaving, the diamond or cross family, the monk's belt pattern and its uses, practical overshot patterns, designing drafts and special techniques, ways of weaving overshot, special four-harness techniques (summer and winter weave, the Bronson weave, the M's and O's weave, the crackle weave, the waffle weave, matta technique, syncopation, double weaving on a four-harness loom). The author then details multi-harness weaves such as multi-harness twill, eight-harness damask design and several others. Then follow discussions of the uses of color in weaving designs, planning borders, the various draft notations (European and American), weaving with synthetic fibers, thread sizes, counts and yardage, and costs of handwoven fabrics. There is a thread chart of warp settings and suitable wefts. A final chapter gives instructions for making several projects from hand-woven fabrics (a folder for linens, a small ornamental box, jackets and suits, and others). The text is fully illustrated throughout, with photographs and labeled diagrams. There are over 160 illustrations in this book. As indicated above, the contents of the book are divided into two sections. The first "Simple or Plain Weaving" includes chapters on: The Story of Thread, The History of Weaving, What it Means to Weave, First Weaving Lesson - Learning Plain Weave, Preparing to Weave a Bookmark, Weaving the Bookmark, Finishing the Bookmark, Weaving a Rug on a Frame, How the Indian Weaves, The Shed and Its Variations, Weaving a Table Mat or Rug on a Loom, The Colors for the Rug, Color Combinations from Nature, The Process of Weaving on a Two-Harness Loom; Threading Plain Weave from a Draft, Making a Two-Harness Table Loom, Making a Plan for Threading the Loom, Preparing the Warp; Setting up the Loom, Preparing the Weft, The Handling of Threads, Two-Harness Design Methods, The Weaving of Rag Rugs in Plain Weave, Useful Articles Woven with Striped Warps and Wefts, Tapestry Technique. Weaving Designs into the Cloth and Design Weaves. Among the domestic arts of a pioneer society, handweaving is one of the most elegant but - with the impact of industrialized manufacture of cloth - one of the first to disappear. In the early years of the nineteenth century, the art was flourishing across eastern Canada; by the end of the same century many of its techniques, except in isolated areas, were little more than a memory. This is the first comprehensive study of traditional handweaving as it was practised in Ontario, Quebec, and the Atlantic Provinces up to i goo. As such, it will interest all lovers of Canadiana and folk art in general, as well as the growing number of handweavers in Canada and the United States who have revived the craft and resurrected many of the lovely old patterns - and who will find in its pages a basic pattern reference book. Keep Me Warm One Night is the culmination of twenty-five years of study, during which this subject has been the major research project of the Textile Department of the Royal Ontario Museum. The authors have carried on fieldwork throughout eastern Canada. They have also extended their research to Great Britain and Europe to trace the origins of the traditional techniques that were carried to North America. Besides the text the book contains more than 500 photographs and drawings which record the material still in existence along, with the history of individual pieces. The opening chapter gives a general historical survey of early Canadian settlement patterns, with particular reference to where and by whom weaving came to be established as a craft, and to the materials available for weaving. The second chapter deals with the tools and equipment used in various parts of eastern Canada. Subsequent chapters concern kinds of weave; costume worn up to 1900; carpets, blankets, and linens; and a large variety of coverlets. There is a select bibliography. The title, Keep Me Warm One Night, comes from an old weaving, draft found in Cape Breton, and is one of the loveliest Canadian pattern names the authors have discovered. For a quarter of a century, amateurs and professionals alike have called The Key to Weaving the definitive guide to handloom weaving. No other volume has started off so many beginners or served as a reference for so many experts. Now this invaluable handbook, acclaimed for its clarity and comprehensive scope, has been revised and expanded to cover all the latest information on colours, fibres, and the newest patterns - including those you design yourself. The result is an easy-to-follow manual by a master weaver whose years of teaching experience enable her to answer every question you might ask and predict every pitfall you'll want to avoid. The Key to Weaving offers step-by-step instructions for the shadow weave and the new six- and eight-harness weaves, explores the intricacies of colour in weaving, and features an in-depth section on fibres and how to use them most effectively. Mary Black presents instructions for dozens of new patterns including book markers, letter weaves, and tartans, and tells how to get the best results with the currently fashionable Zulu and Egyptian weaves. Every aspect of weaving from hatching and huck to free techniques, and from dying wool to unweaving a web and making fringes is discussed in detail. In addition, the new reference tables for converting measurements are an invaluable aid to every craftsman and an up-to-the-minute bibliography tells where to find more specific information on any of the fine points of weaving. Long the classic guide in its field, this new revised edition of The Key to Weaving provides all the information you need whether you're learning the basics or perfecting advanced techniques. Clearly written, comprehensive, and carefully organized for easy use, it is the single volume that no weaver, whether amateur or professional, can afford to be without. NOTE: Several Revisions of this book have been published. The initial Key to Weaving was updated as New Key to Weaving and then revised again as Key to Weaving (2nd Revised Edition) which is the latest version. With clear easy-to-follow instructions, kids find out how much fun it is to weave cool projects using everything from their hands to cardboard to a portable loom assembled from ordinary plumbing parts. (Adults can try too!) Make 15 fun, inexpensive, colorful projects including note cards, friendship bracelets, magic carpets, shoelaces and a West African blanket. Many of which can be completed in a single afternoon. The author has loved weaving since the age of eight, when she made magic carpets for her teddy bears. Now, as a professional tapestry weaver and knitwear designer, she shares the joy of creating beautiful woven items with a new generation of young crafters. Throughout the book are fascinating features about weaving around the world; special projects like weaving a hideout from sticks, branches, and wildflowers; and stories of famous characters such as Penelope, the clever weaver from The Iliad and The Odyssey. The third in STC's Kids Craft series (following Kids' Embroidery and Kids Crochet), this delightful, easy-to-use book brings one of the oldest craft traditions to creative children everywhere. The list of projects in this book include: "Checkerboard Note Cards", "Dancing Map Dolls", "Fairy Garden", "Weave a Hideout", "Friendship Bracelet", "Treasure Pouch", "Rag Doll Warriors", "Inkle Strap Shoelaces", "Tapestry Dog Collar and Belt", "Weaving Bag with Inkle Strap", "Chenille Scarf", "West African Blanket" and "Magic Carpet Coasters & Rugs". A step-by-step format and bright illustrations ensure successful results for children of all ages and all of the projects are inexpensive to make! Kumi-Himo is specifically, a braid consisting of 3 or more strands intercrossed obliquely. Although this "braid" is found in virtually every cure, it is the Japanese culture which has developed the highest order of braid technique and complexity. Dating back to the early 8th century. the Kumi-Himo braid has, in its log history, become intertwined with social and cultural traditions with shape, design, colour, construction and materials as the variable of study. This book is a guide to the technique providing a background of the art form, the tools, materials and basic braiding techniques. Following the basic instruction, the directions needed to braid simple 4 and 8 strand patterns right up to more complex 16 to 32 strand braids are described. The authors have included the weaving diagrams and photos of the finished braid for over 50 variations on the basic designs making this a wonderful book for those interested in trying this wonderful craft. Other works on Kumihimo include: Beads & Braids, Beginner's Guide to Braiding - The Craft of Kumihimo, Braids: 250 Patterns from Japan, Peru & Beyond, Braids and Beyond, Creative Kumihimo, Kumihimo: Japanese Braiding, Kumihimo - Japanese Silk Braiding Techniques and Making Kumihimo: Japanese Interlaced Braids and Samurai Undressed. The author has also written: Sprang: Language & Techniques, Tapestry Loom Techniques: Exploration of the 2 Harness Loom and The Vertical Loom - Principles and Construction. The author gives you comprehensive instructions covering all aspects of preparation, making and finishing 12 different braids - round, square and flat ones. Sections of the book cover a history of Japanese looms, a description of the equipment required, yarns and dyes as well as how to warp braid, fix mistakes and finish your creation. The author details how to make 12 varieties with names like Kara uchi gumi and Shi-no-nome gumi and provides historical information to explain the evolution and name of each. Though there are more braid varieties than those detailed, the ones the author has selected seem to have the most potential for Western weavers. The book includes many black and white diagrams and pictures along with 8 full coloured pages showing the braids. Other works on Kumihimo include: Beads & Braids, Beginner's Guide to Braiding - The Craft of Kumihimo, Braids: 250 Patterns from Japan, Peru & Beyond, Braids and Beyond, Creative Kumihimo, Kumi Himo: Techniques of Japanese Plaiting, Kumihimo: Japanese Braiding, Making Kumihimo: Japanese Interlaced Braids and Samurai Undressed . Kumlhimo Is a very versatile braiding technique. The instructor begins by introducing you to yarns, tools and equipment, then reviewing the process for making a braiding stand (Maru Dai) from foamboard, which allows you to get started quickly with very little investment in equipment. In this course you will learn how to read pattern layout diagrams as you prepare four separate warps, each with a different end treatment: tassel end, finger point (blunt) end, braided loop end, and wrapped loop end. In addition, you will learn how to read and follow braiding diagrams as you work four different braiding projects: 8-strand spiral braid, 8-strand square braid, 8-strand hollow braid, and 8-strand flat braid. Steaming and finishing techniques are also included. To give you ideas for the many ways braids can be used, the instructor presents the work of many accomplished international braiders. Note that the no prior braiding experience is necessary and for materials, you can use many different types of yarn, ribbon, and wire to create beautiful and unique braids. Most of the supplies and other materials needed can generally be found in the home. If you wish to construct the foamboard maru Dai, you will need three pieces of foamboard 20 x 30 inches. The instructor, Rodrick Owen has been researching braiding techniques for thirty years. He teaches abroad, and his book, Braids: 250 Patterns from Japan, Peru, and Beyond, has given guidance to braiders worldwide as well. His approach to braiding makes it suitable for children and advanced braiders. Other works on Kumihimo by this author include: Braids: 250 Patterns from Japan, Peru & Beyond, Making Kumihimo: Japanese Interlaced Braids as well as: Beads & Braids, Beginner's Guide to Braiding - The Craft of Kumihimo, Braids and Beyond, Creative Kumihimo, Kumi Himo: Techniques of Japanese Plaiting, Kumihimo - Japanese Silk Braiding Techniques and Samurai Undressed by other authors. The author originally designed this book as a workshop textbook for her students. The book covers Lace weaves such as Bronson Lace, Swedish Lace, Huck, Spot Bronson and then shows you how to adapt them into your lacey weave project. The material that is contained in this book is a great basis for weavers of all levels to use in recognizing and comparing different lace structures. Each type of lace is given its own chapter that covers the threading system and offers treadling suggestions. This revised edition contains 86 projects with complete worksheets for all including both four and multiple harness projects. Clear photos of woven samples make it easy to follow. Loom manipulated lace weaves are perhaps best known in textile terminology as "mock leno weaves" which is a catch-all phrase to describe a fabric in which floats have been arranged to create some semblance of openings as the threads (warp and weft) slide together to form openings. The document was created as a compilation of notes, illustrations and drafts that form the handouts for the author's workshop on Lace Weaves where she organizes the weaves into 6 categories: Canvas Weave, Huck Lace, Spot Bronson, Lace Bronson, Swedish lace and Offset Huck and then compares and discusses their construction. Crisp diagrams coupled with explanatory text help the reader understand these and the 31 clearly explained projects the author has put together allow them to experience it for themselves. Other monographs by Leslie Voiers include: Conversation & Notes on Log Cabin, Plain Weave is Anything but Plain and Winding Multi-Colored Warps with a Warping Paddle. This book is the reproduction of a collection of weaving patterns by Franz Donat produced in the late 19th century. The purpose of the book was to introduce new ideas into the designing of textile fabrics so that a wide range of patterns could be woven on one loom set up. He wanted to show the vast scope of textile designs that could be developed systematically and be an aid in designing. It is believed that only 5 copies of the original work still exist. The information in Donat's book was computerized and the text was reworded in more modern terminology to create this book as a source for today's weavers. The 330 patterns reproduced include Twills, Herringbone, Crossover, Diamond, Corkscrew, Soliel, Diagonal, Honeycomb, Mock Leno, Crepe, Damask, Rib, Cord and many other designs. 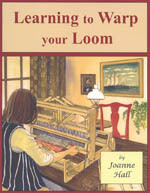 Learning to Warp Your Loom is a perfect guide for beginners, whether warping alone at home or in a class. Also a great help for weavers who want to improve your warping technique. The guide includes 207 diagrams and is presented with a simple and easy to follow instructions in the order weavers need them. Vocabulary terms are defined, explanation of different types of looms, how to tie knots, correct errors, plus metric conversions and a glossary. Other books by this author include Tying Up the Countermarch Loom. When Deborah Chandler started to weave in the early 1970s she had no teacher. The few books she could find gave some very basic instruction, followed by, "Now go ahead - your imagination is the only limit!" Feeling that she had no imagination, Deborah gave up weaving. But it would not leave her alone. Only years later, after learning from some very good teachers, did she realize that before she could use her imagination she needed to understand how a loom works and the basics of fabric structure. Once she understood the tools and processes, she could use her imagination effectively. So that's what Deborah strives to pass on to her students, in person and in writing. Learning to Weave is a four-shaft weaving course which makes learning to weave, with or without a teacher, easy and fun. The writing is friendly and straightforward; the illustrations and photographs are thorough and clean. All you need to know to weave with confidence is here: step-by-step warping (by three different methods), weaving techniques, project planning, reading and designing drafts, the basics of the most common weave structures, and lots of handy hints. Beginners will find this book an invaluable teacher; more seasoned weavers will find food for thought in the chapters on weave structures and drafting. Other works by this author include the videos: Beginning Four Harness Weaving and Introduction to Weaving. The simplest line is a dot. More complexity occurs when you connect these dots. A line is the way you get from dot A to dot B. But, what about lines in tapestry? How do you tame a line and make it do what you want? Don't panic! You're in luck. This book is written about line use, line technique and producing lines in tapestry - from the simple to the difficult. Been weaving tapestry for awhile? Then you are aware that there are sometimes difficulties with weaving the perfect line for the situation. Or are you a beginner who wants to get a good technical foundation? Then knowing how to weave lines easily and correctly is important. How do you keep them from being wavy when you need them perfectly straight? How do you shade with dots or create a floating bar? How do you make vertical straight lines? Or lines that travel in all directions? Are you interested in the linear techniques of kelims such as zilli, soumak, and cicim? What about textured lines such as those made with chaining or brocading? How do you tame a line and make it do what you want? This book is written about line use, line technique, and producing lines in tapestry from the simple to the complex. There are explanations and illustrated techniques for producing lines for all occasions and purposes. If you want to understand line usage in tapestry, this is the book for you. This book also has a great deal of information of that would be of general use to tapestry weavers. These include: preparing weft bundles so that the group of yarns lie flat and weave in without tension problems, wrapping bobbins efficiently, stabilizing edges, understanding and using hill and valley threads effectively, and using the technical aspects of weaving to help support the aesthetic possibilities of the tapestry design. If you want to understand line usage in tapestry, this is the book for you! Other books by this author include Shaped Tapestry, So Warped - Warping a Loom for Weaving Tapestry and Tapestry 101. 1989, B. T. Batsford, Ltd.
All hand spinners and weavers, whether or not experienced in this aspect of the craft, will welcome a detailed description of the spinning and weaving of linen. Patricia Baines covers all stages of the process in great detail, from the unique properties of the flax fibre right through to finishing and caring for linen. She passes on a vast amount of detailed knowledge, gained through practical experience, with many alternative approaches which readers will appreciate as they develop their own skills. The result is a book, which is both authoritative and accessible. Spinning techniques are described with detailed coverage of dressing distaffs and the most suitable tools to use. Every aspect of preparing the yarn is covered: bleaching and dyeing with suitable natural dyes as well as modern reactive dyes. The section on weaving is specifically for the use of hand-spun yarns, although it will be helpful in connection with machine-spun yarns: there are detailed descriptions of warping, dressing the loom, sizing and the actual weaving process. Basic drafts of traditional patterns are given, with guidance on analyzing patterned linen as a starting point for the weaver's own work. A description of the shaft draw loom opens up the possibilities of designing diaper block patterns and damask motifs. The author ends with background information on flax and its processing; related fibres such as hemp, ramie and nettle; and spinning for lace, knitting and crochet. All readers, both novice and expert, will welcome the particularly detailed glossary. No other single volume covers this subject in such detail: this book is likely to be the standard source of information for a long time to come. Lithuanian Sashes is an academic work complete with bibliography, index and symbol keys for various sash motifs. As part of their documentation for the book, the authors closely examined several thousand ancient Lithuanian sashes, of which roughly one thousand were reproduced in the book, for the greater part in the original colour. To date this is the only existing book about sashes in English. In writing the book the authors explored various archeological, historical and ethnographic sources as well as closely studying numerous sashes they had brought with them from Lithuania. Extensive use was made of drawings of sash motifs, photographs, sash motif albums, newspaper articles, as well as periodicals specifically devoted to sashes. In ancient Lithuania, a sash constituted a symbolic gift, especially at weddings. The tradition of sash weaving has been preserved to this present day, not only in Lithuania but in all countries where Lithuanian families have established themselves. Lithuanian Sashes addresses itself to a wide public - university students, artists and sash weavers who fashion sashes for Lithuanian national costumes, or ceremonial sashes commemorating some cultural endeavour. The book Lithuanian Sashes by Anastazija Tamosaitiene and Antanas Tamosaitis provides basic and universal information about ethnographic Lithuanian sashes concentrated in one volume. The co-authors are artists, Lithuanian Folk Art experts, specializing in textiles and especially in sash traditions, their patterns, colours and weaving. A book of patterns and hints for weavers with 16 shaft (harness) looms, scanned pictures of woven samples and computer drawdowns showing two hundred and eighty-three (283) numbered and different patterns. All of the scanned woven samples are marked with corresponding numbers. Many of the patterns can be used easily with treadle looms but all can be used with dobbies or computer assisted looms. Based on Franz Donat's Large Book of Textile Designs. Note that the 24 shaft version of these books was reprinted as a single volume titled Crepes, Diamonds, Gems and Twills - 24 Shaft Patterns. A book of patterns and hints for weavers with 16 shaft (harness) looms, scanned pictures of woven samples and computer draw-downs showing two hundred and eighty-four (284) numbered and different patterns. All of the scanned woven samples are marked with corresponding numbers. Many of the patterns can be used easily with treadle looms but all can be used with dobbies or computer assisted looms. Based on Franz Donat's Large Book of Textile Designs. A book of patterns and hints for weavers with 16 shaft (harness) looms, scanned pictures of woven samples and computer draw-downs showing two hundred and forty-eight (248) numbered and different patterns. All of the scanned woven samples are marked with corresponding numbers. Many of the patterns can be used easily with treadle looms but all can be used with dobbies or computer assisted looms. Based on Franz Donat's Large Book of Textile Designs and many other designs. A book of patterns and hints for weavers with 16 shaft (harness) looms, scanned pictures of woven samples and computer draw-downs showing the front and back sides of each of ninety-six (96) 16 x 16 tie ups or peg plans; one hundred and two (102) extended peg plans. "f" following the number of the pattern indicates the front side and "b" the back side. All of the scanned woven samples are marked with corresponding numbers. Based on Franz Donat's Large Book of Textile Designs and many other designs. The second revision of this in-depth study for Double Weave enthusiasts, this "notebook" is an informal sharing of Paul O'Connor's expertise on loom-controlled double weave for four and more harnesses. It is the result of fifteen years of working with double-layer and multiple-layer weaves. In this text he includes the many variations of double weave and demystifies double-weave tie-ups. This notebook also provides drafting and weaving tips, explains multicolour, multilayer and 3-dimensional weavings and describes, analyses and explains art weavings in layer weaves. The primary focus of this book is loom-controlled double weave, usually in balanced plain weave. Each chapter begins with some principle of double weave, and ends by presenting weaving which emphasizes those principles. The analysis of the weaving is the author's and is meant only to suggest how the pieces might have been woven. Chapter One reviews the basics of double weave with a four harness loom. In subsequent chapters the discussion moves to double weave using more than four harnesses. The directions refer to a jack loom with rising shed. Threading is straight draw unless otherwise indicated. All threading and tie-up directions and all treadling orders move from left to right, which corresponds to the direction we read and write English. The book is extensively illustrate with drafts, weave-structure diagrams, line drawings and includes 45 black & white and 12 colour photographs showing completed works by the author. A comprehensive bibliography of books and articles along with a detailed index completes the work. The author has also written the follow-up book to this one titled: More Loom-Controlled Double Weave. A complete set of highly detailed plans for constructing a 45" 4-Harness Jack floor loom. Besides plans for the loom, there are plans for making shuttles, bobbins, a loom bench, a spool rack, and a temple. This book describes the development of the loom from a crude wooden frame to a sophisticated electronic weaving machine. It introduces common textile terms and techniques and there is a description of primitive looms, such as Greek Tapestry and Navaho blanket weaving. Medieval craft guilds, the domestic system and Yeoman Weavers are dealt with, while handloom weaving is contrasted with the powerloom and the mill system. The authors examine the decorative fabrics such as brocades produced on early Chinese drawlooms and the introduction of Jacquard and dobby weaving in the nineteenth century. The reaction against industrialization and William Morris's inauguration of the Arts and Crafts movement are discussed in relation to the craft revival of the twentieth century. The book continues the history of looms and weaving beyond the invention of the Northrop automatic to include special woven effects and twentieth-century technological development, including today's computer-based weaving machines. This is a wonderful little book illustrating the history of the loom using many fascinating black and white photographs and drawings. With this introduction, the author begin her detailed exploration into the effects of wet finishing woven cloth. The book provides specific illustrated instructions on finishing Cotton, Linen and Ramie, Rayon, Tencel, Chenille, Silk, Wool (including sections on Scouring, Fulling and Worsting) as well as other Animal Fibres. She then describes special techniques such as Warp Dressing (Sizing), making Flax Seed Dressing, De-gumming Silk, making On Loom Twisted Fringes and a fringe on four sides. A list of Suppliers, Definitions and an Index completes what is on it's own, a very good guide to finishing woven cloth, but for the author is only the warm-up! This is a valuable reference work that goes beyond the topics covering in most weaving books completing the process of turning yarn into garments. Loom-controlled Doubleweave is explored in depth in this handbook of out-of-print articles from textile innovators, Weaver's and Prairie Wool Companion. This is the 5th in a collection of Best of Weaver's compilation books. Detailed instructions and gorgeous photographs illustrate how to design and weave 30 different projects including place mats, coverlets, jackets, bags, wall hangings, and throws using four- to sixteen-shaft looms. Instructions on the various ways to produce multiple layers with a loom - block-double weaves, stitched double cloths, and double-layered colour effects - are provided alongside basic and intermediate-level drafting illustrations. The complete list of articles included in this book are: "Twice as Wide: A Herringbone Blanket", "Double Wide, Double Warm Throw", "Double-width Overshot Tablecloth", "A Double-width Coverlet", "I's an "L" of a Shawl! ", "Ruana in Stitched Double Cloth", "She Fancies Plush: Two Self-lined Jackets", "Double Tartan with Extra-weft Stitching", "Designing Stitched Double Cloth", "Double-weave Jacket in Interlocking Crosses", "Color Windows", "Windows Coat", "Reversible Panel Vest with Color Windows", "Mixed Color Effects in Double Weave", "Summer Sherbert Runner", "Color in Loom-controlled Double Weave", "Patchwork Jacket in Double-woven Twill", "4-block, 4-shaft Double Weave", "Shamrock Table Runners", "Mug Rugs". "Colonial Double-weave Table Runner", "Symmetrical Turning Blocks", "Overshot-patterned Double-weave Coverlet", "Network Solutions: Overshot to Double Weave", "Grandma's Game Bags", "Sequins and Silk: Camisole and Skirt", "Baffle Weave: Mixing Layers on the Loom", "Double, Double Toil and Trouble Runner", "Network Drafting: Double Weave", "Double Weave a la Carte", "Raising Eyelashes", "Eyelash Vest", "Unconventional Double-weave Shawl" and "Playing with Double-weave". The other books in the Best of Weaver's series include: Fabrics That Go Bump, Huck Lace, Overshot is Hot!, Summer & Winter Plus, Thick'n Thin and Twill Thrills. This book is for all who wish to become weavers and for all who wish to review "the basics" alone or as a study group. It is a how-to-book which takes you step by step through "the basics" of handweaving. This is the first book in a series to be written that introduces the reader to different types of weaving with simple equipment and tools. They then learn textile terms, how to draft patterns, analyze fabrics, work with yarns as well as to sample and weave exciting projects. The book includes hundreds of tips from a long-time professional teacher and through it, the reader will meet handweavers from around the world who weave every day. They will find inspiration in works of some of the foremost textile artists anywhere. Some of the topics covered in this book include: handweaving traditions around the world, small portable simple looms, shuttle looms and equipment, basics of terms/sett/yarns/fibers/skills, warping and weaving back-to-front and front-to-back, modified sectional beaming, drawdowns, traditional overshot techniques, fabric analysis, weave a rainbow, magic carpet, with rags and "weftovers" from 4 to 8 shafts. The book is lavishly illustrated with 350 colour photographs. The Maker's Hand is an inspiring resource book for engineers, architects, designers, weavers and other craftsmen, and indeed all those involved in assembling threadlike elements into functional structures. Peter Collingwood, for whom structure is a consuming interest, has selected over ninety objects from around the world, each of which he analyses in detail, revealing the inevitable beauty that can be achieved only by a marriage between appropriate materials and ideal structure. In many cases the structures have been evolved and perfected over centuries. All the objects, which range from Indian camel girths to the springs of a US army Jeep seat, from Japanese triaxial silk to Botswanan beer strainers, and from Omani sandsocks to a Tuareg hat, have been specially photographed by David Cripps to complement the author's analytical diagrams. Together they provide a book of outstanding visual appeal. Few people have the knowledge and experience to understand and analyze so wide a range of structures, but Peter Collingwood does so triumphantly, offering a unique insight into the balance of material and structure that should be the basis of all design. This is a beautiful and intriguing book extensively illustrated with 163 line drawings, 64 colour photographs and 48 black and white photographs in this revised edition. Other works by this author include: The Maker's Hand, Peter Collingwood - His Weaves and Weaving, Rug Weaving Techniques: Beyond the Basics, Techniques of Ply-Split Braiding, The Techniques of Rug Weaving, Techniques of Sprang and The Techniques of Tablet Weaving as well as the The Journal for Weavers, Spinners and Dyers - Peter Collingwood Special Edition compilation of articles. Most textile artists these days know about the precise multi-faceted braiding from Japan that comes under the word "kumihimo". The key to that branch covered by this new manual is the word in the subtitle, "interlaced". The small, marudai and kakudai, stool style of weighted, bobbin braiding has seen new books and nice equipment made available for study and practice over the past decade. We, Westerners, have not seen much, except in Japanese language, imported books, about the other styles of bobbin braiding: takedai and ayetakadai, made on a "bench" that looks more like loom. The finished braids are flat fabric-like structures that are familiar to those who have looked at the various interlacing techniques from around the world. As with the other styles of bobbin braiding, there are basic structure patterns, or moves, and then, there are color arrangement patterns. Rodrick Owen presents some amazingly clear diagrams of the structure and color patterns. If you have the weighted bobbins from working with your little marudai, the work bench for takedai, nice materials like the traditional stranded silk, and interest in advancing your personal repertoire of braiding skills, then this basic manual for takedai (maybe a trip on the Internet to Rodrick's links) will enhance your study. The literal translation of Kumihimo is "the gathering of threads", although the name can be applied to all forms of Japanese braiding. In this original and fascinating title, Roderick Owen uses his years of experience to unlock the secrets of the closely guarded world of the Takadai - a form of Kumihimo in which single- and double-layered flat braids with a plain weave and twill structure are made using a highstand frame. Illustrated with over 150 photographs, 70 charts and 65 illustrations, Making Kumihimo is an ideal gateway for any textile worker, from weavers to embroiderers, wishing to incorporate this ancient and beautiful style of braiding into their work. The author's step-by-step instructions have been developed to make the designs easily accessible, and the contents serve as an excellent and comprehensive introduction to the art, covering the history of Kumihimo, equipment, material, methods, single-braid designs (including colour, weave and rep-weave patterns, and braids with decorative edges), and double-braid designs (including patterned, textured and pick-up patterns). Other works on Kumihimo by this author include: Braids: 250 Patterns from Japan, Peru & Beyond, Kumihimo: Japanese Braiding as well as: Beads & Braids, Beginner's Guide to Braiding - The Craft of Kumihimo, Braids and Beyond, Creative Kumihimo, Kumi Himo: Techniques of Japanese Plaiting, Kumihimo - Japanese Silk Braiding Techniques and Samurai Undressed by other authors. This is the most comprehensive book on braiding that we have yet come across. In fact, it is a course of instruction. Starting with the simple three-strand braid, it gradually advances to larger flat fabrics in plain, ribbed and twill interlacements, then to tubular, two-layer and solid braids reaching, finally, such complex forms as have never been dealt with before. Instructions, with accompanying diagrams, demystify the process of making the braids. Profusely illustrated with complex line drawings showing the techniques as well as black & white photographs showing finished works. Chapter titles in this book include: "Field Research in Japan", "Preparatory and Auxiliary Processes", "Balanced Plain Interlacing", "The Cramming-Spacing Effect", "Balanced Ribbing", "Flat Angled Ribbing with Paired Elements in a Concealed Course", "Inverting the Slant of the Passages", "The Arrow-Pattern", "Introduction of the Track-Plans", "The Industrial Braiding Machine", "Twill Oblique Interlacing Flat and Tubular - Worked with Free Ends", "Braiding with Complementary Passages", "Ply Splitting", "Sprang", "Loop-Manipulation", "Reciprocal Braiding", "Taka-Dai", "Table-Supported Braiding", "Japanese Maru-Dai and Kakku-Dai", "Naiki-Dai, A Japanese Machine Designed to Produce Tubular Braids", "Fist-Supported, Finger-Secured Braiding", "Tubular Braids in Plain and Twill Interlacing", "Warp-Twining on Special Tools", "Aya-Take Dai, A Japanese Tool", "The Triller or Corell-Machine", "How to Analyse and to Represent the Structure of a Finished Braid", "Classification", "Theoretical Considerations", "Structures Which Could be Mistaken for Braids" and "Dealing with the Two-Ridge Flat and the Four-Ridge Square Braid". As well as a detailed Tabel of Contents, the author has included a good Glossary and Bibliography. Every weaver, regardless of their experience level, is sure to find a number of ideas to improve their weaving in this handy collection of tips covering all facets of weaving. Whether it is to make the process more enjoyable, solve a problem or just find a better or different way to do something, this book has it. The tips and techniques are clearly described and are illustrated with line drawings. Topics covered include: adjusting your loom, winding bobbins, removing finished cloth from the loom, making your own bobbin winder or warping board, getting good selvages, replacing broken warp threads, how to get smooth selvages, stitches to join handwoven strips, how to make tassels and rope, a collection of handy weaving knots, how to draw down a draft, weaving finishes and much more! This is a reprint of the 1984 version of the classic handweaving guide originally published in Swedish in 1950. The original Swedish work has been completely translated into English and is a wonderful testimony to the author's thorough knowledge of textiles from around the world. The first two thirds of the book documents almost every weave structure known, with each illustrated using a black and white photo of the fabric along with a draft including drawdown. Included in these are such patterns as Overshot, Crackle, Monk's Belt, Lace Weaves, Beiderwand, Lampas, Damask as well as Tapestry, Pile, Pick-up and other hand-manipulated weaves. Along the way, the author includes extra information like a detailed description of Damask Looms (with and without various drawloom attachments) and an explanation of their operation. 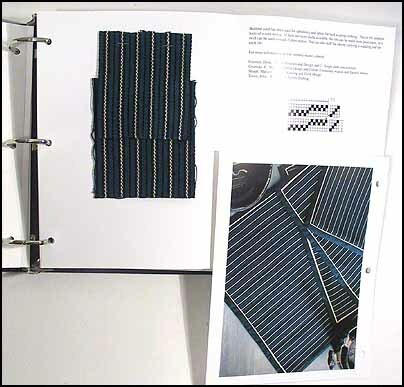 The remainder of the book provides the reader with additional skills by explaining fabric analysis, showing how to perform project calculations along with warping, loom tie-up and weaving techniques. The book is extensively illustrated with diagrams and photos and makes an excellent addition to any weavers library. This is the most important new weaving book Interweave has published in almost 20 years. Sharon Alderman, one of the finest weavers in America and a regular contributor to Handwoven magazine, has written a book that teaches you the finer points of weave structure in the same personal way a friend would encourage and inspire you. The freedom to imagine a wonderful fabric and create it successfully lies in mastering the fundamentals of the craft. And what is more fundamental than weave structure? Sharon Alderman has made a lifework of creating exquisite fabrics and, in Mastering Weave Structures, she shares the depth of her knowledge. More than just a survey of interlacements from simple to intricate, Mastering Weave Structures is a study course for weaving the best, most interesting, most successful fabrics you can imagine. A thoughtful reading will free you from the limitations of published drafts. You will discover how to design your own threadings, to use the design power of the tie-up, to make the most out of treadling options. The author also shares her years of experience in understanding fibers, setts and colour interactions, and in finding the most accurate and efficient ways o manage the weaving process. You will find both inspiration and useful information in the scores of colour photographs of her fabric samples, the product of more than thirty years of serious exploration. The book is filled with clear explanations, wonderful examples, and colour photographs of stunning designs to introduce the reader to the fundamental principles of weave structure. Beyond selecting or modifying a draft, Sharon also helps you make decisions about choosing the fibres and yarns you need to produce endlessly inventive fabrics. Comprehensive and detailed, the chapters cover weave structures like Plain Weave, Twills, Satin, Waffle Weaves, The Distorted Grid, Compound Weaves, Loom-Controlled Doubleweave, Bedford Cord and Piques, Loom-Controlled Pile Weaves, Crepe Weaves and then expand upon these with chapters titled: "Some of This, Some of That", "Inventing Your Own Weave Structure" and "Summing it Up: Where to Go From Here". The Appendices cover subjects such as: "How to Turn a Draft", "Deciphering Industrial Drafts" and "Calculating Setts". The gorgeous book is generously illustrated with 60 photographs, 30 illustrations and 290 drafts. Mastering Weave Structures is destined to become a new classic and should be on every weaver's bookshelf. In addition to an amazing number of articles in Handwoven magazine, the author has also written the books: Handweaver's Notebook and Handwoven, Tailormade. The Jakalteks have lived in the highlands of northwest Guatemala since pre-Columbian times. The women maintain their traditional clothing style. The hair sash is the only item that is still locally woven. It is an important trade item and is exported worldwide. While the designs on the sashes may appear to be embroidered, they are actually created as the fabric is woven. Jakalteks use a double-faced supplementary-weft brocade technique to create a variety of geometric and pictorial motifs on a warp-faced fabric. This is more than a book documenting hair sashes. The technical information includes a valuable analysis and comparison of forty-five hair sashes collected between 1927 and 1989. In addition, a wealth of historical background is presented in a very readable style. One chapter summarizes the development of weaving in the area, beginning with the first evidence of pre-Columbian textiles. The fibers and the tools used to create the hair sash, as well as the double-sided brocading technique used by the weavers, are all well documented. Black-and-white photos show the steps involved in using the warping frame and the loom - there is even a photo showing a blind man making a ply-split backstrap from 2-ply sisal. Another chapter documents the physical and spiritual importance of weaving and clothing to the Jakalteks that includes sections on pre-Columbian cosmology, weaving deities, and the symbolism of huipiles, hair sashes, colors, and motifs. There are 38 illustrations, 116 black and white photographs, and 15 color photographs in this book. The author has written it in both English and Spanish with the English text being on the even pages and the Spanish translation on the odd. This monograph explores the rich weaving heritage of Mexico focusing on the Oaxaca region. The author provides a background of the weaving found in this area with information on the history, patterns and techniques used by the local weavers. She puts special focus on a number of designs including a Three-shaft Warp-face weave, a cotton shawl in Leno or Gauze weave, a fine cotton warp-pattern fabric, the Oaxaca Belts and a Mexican Men's Jacket before finishing off with some information about commercial handweaving in Mexico. If you are interested in learning more about weaving "south of the border", this is an excellent guide from a master weaver. This is Monograph Four produced by the Weavers Guild of Boston, Massachusetts. This book is the follow-up to the author's earlier book Linen Heirlooms published in 1968 and documents a collection of 18th and early 19th century linens given to her by other guild members. There are twenty-two different patterns in this collection. These include 4, 8 and 10-harness Point and Turned Twills, 4 and 5-harness Bronsons, 4-harness Overshots and 4 and 5-harness M's and O's. Each of the pieces is documented as to its origin and the author's drafts and designs have been included. Other monographs by the Weavers Guild of Boston include: From Weaving to Knitting, Josephine Estes' Miniature Overshot Patterns for Hand Weaving and Versatile Bronson. The follow-up book to the author's Loom-Controlled Double Weave, this "notebook" is the continuation of his exploration of the fascinating world of Doubleweave. After presenting his definitions for units and blocks and tie-up methods, the book goes into more depth and provides more detail covering such topics as: Four Blocks of Double Weave with an 8 Shaft Loom, Eight Blocks of Double Weave with an 8 Shaft Loom, Another View of Blocks in Double Weave, Colour and Weave Effects in Double Weave, Stitching Cloth Layers in Double Weave, Use of a Third Weft in Double Weave, Use of a Third Warp in Double Weave, Tieups, Drawn and Quartered, An Unusual Sett for Double Weave and Flying Bridges. The book makes extensive use of visual explanations and is illustrated with a very large number of drafts, weave-structure diagrams and line drawings. It is the perfect book for weavers who want to push the doubleweave technique to its limits or who like the author "likes puzzles but even more, enjoys understanding them"! 1992, Robin and Russ Handweavers, Inc.
A book for experienced weavers who want to explore multiple harness weaving. Learn the principles that allow you to create your own patterns. Starting with rib and basket patterns, the reader sees how two harness weaves can be extended into 6, 8, 10 or 12 harness weaves ... whatever your loom size.. Ribs into Baskets ... Next, a thorough discussion of twills ... Twills, Twills, Twills!!!! Then you can explore block designing and what you can do with it as a multiple harness weaver. What else is there? ... Multiple layered weaves-backed cloth, double cloth, piques, bedford cord ... and techniques like centre stitching, wadding. Now back to all the twills you couldn't do on four harness. Let's mix them up ... Sometimes it's fun to mix weaves provided you know the rules. Terms are well defined for easy understanding. Rules for designing your own weaves are clearly stated. Now in it's third printing, MORE THAN FOUR is used throughout the world as a textbook at many well known art and textiles schools and universities. This is Shuttle Craft Guild Monograph Thirty Five. This is the first of seven monographs to be written from Dr. Bateman's unpublished monograph. Multiple Tabby Weave is an extension of the M's and O's technique; however, Dr. Bateman's development of it makes many of his 4, 6 and 8 harness drafts and samples unrecognizable as the traditional technique. This is the 1st volume in a series that reproduces the contents of Dr. Bateman's manuscript documenting his work in weaving samples. These have been reproduced in 6 monographs by the Shuttle-Craft Guild with this volume being Monograph Thirty-Eight. The other 5 volumes of Dr. Bateman's work are titled: Bateman Blend Weaves, Boulevard, Chevron and Combination Weaves, Extended Divided Twill Weaves, Extended Manifold Twill Weaves and Park Weaves. 1999, W. W. Norton & Co. In the museums of Urumchi, the windswept regional capital of the Uyghur Autonomous Region (also known as Chinese Turkestan), a collection of ancient mummies lies at the centre of an enormous mystery. Some of Urumchi's mummies date back as far as 4000 years - contemporary with the famous Egyptian mummies but even more beautifully preserved. Surprisingly, these prehistoric people are not Asian but Caucasoid - tall, large-nosed, and blonde with thick beards and round eyes. What were these blond Caucasians doing in the heart of Asia? What language did they speak? Might they be related to a "lost tribe" known from later inscriptions? Few clues are offered by their pottery or tools, but their clothes - woolens that rarely survive more than a few centuries - have been preserved as brightly hued as the day they were woven. Elizabeth Wayland Barber describes these remarkable mummies and their clothing, and deduces their path to this remote, forbidding place. The result is a book like no other, a fascinating unveiling of an ancient, exotic, nearly forgotten world. This wonderful book is illustrated with 25 colour photographs as well as numerous black & white photos, line drawing and maps. Other works by this author include Women's Work - The First 20,000 Years.